Nihari is a deliciously smooth flour based stew with slow cooked mutton and a myriad of spices. This mutton nihari recipe takes ~4 hours to cook but it’s easy to put together. To get the best flavour, the mutton is cooked on very low heat for upto 4 hours. Traditionally Nihari was cooked all night and then served to the Mughal Kings of Delhi in breakfast after the morning prayers. From the royal kitchens of the Mughals, the dish has now crossed all borders of region, religion, and course. However, since it takes a long time, almost 5 hour, to cook Nihari, it is mostly reserved for special occasions like Eid dinners and other festivities. The first time I had nalli nihari was after my marriage when I was exploring the world of non-vegetarian cuisine. I was told it was one of the dishes that has converted many vegetarians. I loved the nihari stew and I could see how between Sikander and daddy the whole 1/2 kg mutton nihari was finished in just one meal. That meant I had to learn how to make nihari. Which meat is best for Nihari? In India, nihari is mostly made with mutton or gosht which is goat meat. The shank portion is what is preferred for making Nihari. Nihari can also be made with chicken, lamb, or beef. I had asked my Pakistani neighbor and she said that both mutton and beef nihari are common preparations in Pakistan. Just like garam masala, Nihari masala is a mix of whole aromatic spices. The whole spices like cardamom, fennel, cloves, nutmeg, dry ginger etc are roasted and then ground to a powder. The masala mix is best when prepared fresh but you can make it larger quantities and store in an airtight container. The homemade nihari masala keeps well for up to 6 months and can be used for cooking other vegetarian and non-vegetarian curries as well. Check out my glossary of Indian spices for a list of spices and their names in both Hindi and English. If you like this recipe, please take a moment to rate it and/or leave your comments at the end of the blog. It will really encourage me to keep exploring, learning and improving. Imagine the chefs in ancient Mughal cuisine who would cook it overnight! 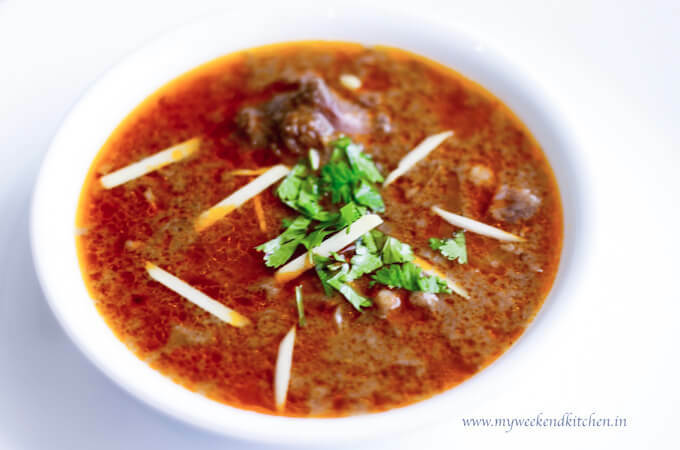 Do you know more about the traditions of mutton nihari? I would love to know! Nihari is a deliciously smooth flour based mutton stew of slow cooked in a myriad of spices. Reserved for royal kitchens in the past, nihari masala is a delicacy, now found in many restaurants in Delhi, Hyderabad, and Lucknow. To make your own Nihari masala from scratch, dry roast all the whole spices for the masala; cool; and grind them to a fine powder. Heat Ghee (you can use oil as well but ghee makes it tastier) in a deep bottom stock pot. Once the ghee is hot, add the sliced onions and fry till they start to turn brown. Add mutton pieces, ginger paste, garlic paste, coriander powder, turmeric powder and salt. Mix well to coat the mutton in ghee and spices. Sauté for 5 mins. Add the nihari masala and 8 cups of water. Mix well, cover and cook on very low heat for about 4 hours until the meat is tender. Keep checking in between. The way to know that the meat is cooked is when it breaks easily with a wooden spoon. Dissolve wheat flour in half cup of water such that there are no lumps. Slowly add it to the gravy. Stir to mix it well in the gravy and let it simmer for another 10-15 mins till the gravy thickens. Sprinkle some lime juice and garnish with ginger strips and fresh coriander leaves. Serve hot. Nihari masala is great for both vegetarian and non-vegetarian curries. You can use it in recipes like chickpea curry, or rajma masala. Tried this recipe?Share with @myweekendkitchen or tag #weekendkitchen! If you try this recipe, I would really love to know how it went. Tag your picture with #weekendkitchen on instagram or connect with me on Facebook, Twitter, Google+, and/or Pinterest. Or join our newest journey into Recipe Videos. Would love to start a conversation, share recipes, cooking experiences and food stories from India and around the world. Why didn’t you add red chilli powder to the nihari? Please recheck your recipe. And only 4 tbsp ghee for 1 kg meat? Your measurements are pretty off. Doesn’t seem like an authentic recipe. Nice photos by the way!!! Thank you so much for your response. I am so happy you liked the photos and I am glad you asked about the chilli and fat..
1) I actually did not use red chilly powder.. The spices in the homemade Nihari Masala add in the heat, so I omitted the red chilly powder. I am actually in the process of completely removing the red chilly powder from my kitchen and use only fresh chillies if required. 2) Red meat release a lot of its own fat, so this recipe didn’t need more ghee than that. In the end (as can be seen in the photo) there was a lot of fat in the dish. nice recipe will try it soon! what is so bad with red chilly powder? Red chilli powder is very easily adulterated with impurities. I have now starting grinding my own red chilli pepper for use in some recipes so I am sure of its purity. But then also, it’s a personal preference to use fresh chillies over ground spice. Yes! I also tried this recipe. It was awesome and I was famous in my home town. I was really happy! That is so amazing to hear Sadaf! I am glad the recipe was helpful! All your comments encourage me to keep trying new things and sharing! Well, I use other spices like kali mirch and garam masala spices to get the heat. The reason I avoid red chili powder is because of food adulteration is specifically high in red chili powder. Now I have started to grind my own red chili powder at home. 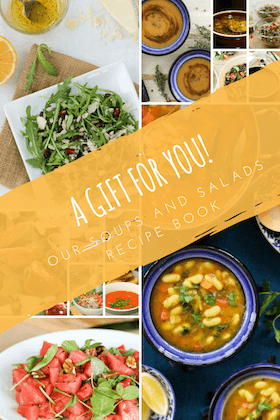 This recipe is very popular amongst my family and also amongst many readers. Do not judge anyone before knowing the fact of taste. I already tried this recipe and its far more gorgeous in taste. awesome! 🙂 Do share your feedback once the party is over and you have rested! Good Luck. THE BEST! I made it yesterday and the entire family really enjoyed it. Thanks for sharing the recipe. Will try it in my instantpot. Would you alter anything for cooking chicken instead? will change the cooking time for sure. Chicken cooks much faster than mutton..
Hope you try this recipe soon! we use wheat flour to give the gravy a thick texture. Would love to know your recipe too. This was the awesome recipe I was searching on internet from last 2 days for best recipe finally I think this one is nice surely gonna try and gonna try more recipes from here thanks author for sharing. I am so glad you finally found the recipe 🙂 It really is a nice one! Thank you so much for sharing your thoughts.. it keeps encouraging me to improve! Its really good.. I tried and my family liked it too..
Dear Ashima, the measurement of masalas were perfect. I am new to kitchen and when I cooked Mutton Nihari as per your instructions, it came out really well..yes I added little chilli powder and ghee for flavour and colour. Well it depends on individual choice of taste.Thank you for posting the recipe. I think the beauty fo Indian and Pakistani cooking is its adaptability to taste. No measurement is like a solid line and you can easily adjust the spices to your taste! I am so glad you found the recipe helpful! This recipe is fantastic! I added some Kashmiri chilli powder about 1hr before the beef shanks were finished. I also used high quality bakers flour and it was delicious! Would you recommend eating it with rice or any naan/bread? A happy day to you from Bucharest! I am glad you liked the recipe. Thank you so much for your feedback. You can eat it with either rice or other Indian flatbreads. Can u give me how u make your own red chili powder do u use kashmiri chillies will. Appreciate it. Yes, I do use Kashmiri red chilies. And to make my own red chili powder, I simply remove the tops of dried chilies and grind them in my spice grinder. Please be extra careful to protect your hands and face (especially eyes) when doing so! For authentic taste of Nihari Kulche, try Raheems Kulche & Nihari of Lucknow Chowk area. He is the best and very popular in Lucknow. This is a famous awadhi cusine and was as old as the time of Wazid Ali Shah, the famous Nawab of Lucknow. Thanks for sharing the local eats of Lucknow! Hi. 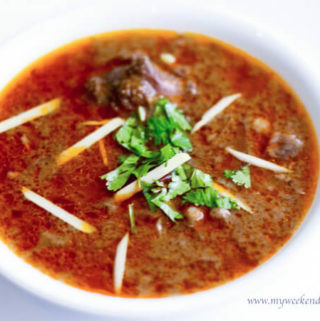 Ashima super nice nihari recipe. I’m glad you liked the recipe. Why did you use Tumeric in Nihari? I add turmeric in most of my curries as it is a great immunity builder and a little bit of it doesn’t change the taste of the dish. In Indian cuisine, we normally add it in almost all savory dishes. I just had nihari at kareems last week and i tried to make it today by this receipe, just green chilli in the end and it was fu****g same as i had in kareems……….. This recipe looks really great! I am hoping to try it this weekend. Can I just clarify one thing please? The ingredients that you listed for making the masala from scratch – is that the equivalent of the 3 tbsp you mention we should use for this recipe that serves 6 people? Or is that masala recipe enough for future use and so those measurements are for a huge quantity? I hope my message makes sense!!!!! The measurements for the spice mix will make you just about 3 tbsp of the spice mix for use in this recipe. You can increase the quantities to make more and keep for later. Do let me know how it goes!